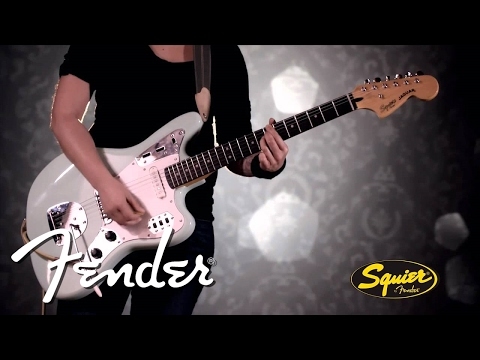 The Squier Vintage Modified Jaguar electric guitar provides the features that has made it such a firm favourite for some of the most enigmatic guitarists in recent history, and delivers a truly awesome guitar at an affordable price. The Jaguar has been the guitar of choice for some of the finest musicians in recent history, including Kurt Cobain, John Frusciante, Johnny Marr, and Kevin Shields. If you’re looking for a highly versatile tonal selection, a comfortable playing feel, and a reassuringly reliable build quality, then it doesn't get much better than the Squier Vintage Modified Jaguar. The basswood body offers a lightweight and comfortable playing feel, with a well-balanced tonality that gives the VM Jag a delightfully unique tonality. The slender Jaguar body profile is a rests snugly during performances, with weight distributed perfectly across the body and neck. The body is finished in an eye catching Olympic white, with a subtle layer of gloss polyester adding protection. The body top around the pickups and controls is protected by a 4-ply tortoiseshell pickguard. Fitted to the body is a slender C-shape maple neck, which provides a responsive playing feel. Married to the neck is a delightful rosewood fingerboard, which is home to 22 medium-jumbo sized frets that are decorated with white dot position inlays. The fingerboard has been shaped to a 9.5" fingerboard radius, which lends itself perfectly to smooth string bends and deft chord-transitions. The Jaguar is renowned for its unique and innovative control system, featuring several switches that access integrated rhythm and lead circuits. Both of the single coil-pickups are Duncan Designed models, ensuring superb quality of tone, and they also feature classic styling with those iconic Jaguar "claws". Switches are installed for several tone variations and leave you with an universe of tones to explore. A vintage-style tremolo bridge with non-locking floating vibrato allows you to infuse subtle vibrato and tremolo into your playing with the greatest of ease. The tremolo bar can be adjusted to suit your playing style, and the trem always returns to starting position efficiently. The vintage-style tuners uphold tuning integrity with the utmost precision. The Squier Vintage Modified Jaguar electric guitar is a fantastic model for those who crave classic vibes, but also like the benefits that come with modern appointments. Posted on 23/01/2017 by nolish A lot better then the normal fender jag! Often think that about the squires.